The theme “cracks wise” by cracking wyes, aka Y’s. The Y’s I’ve circled need to be “cracked” in the Down answers to become a VI, rebus style. So THAT’S HYSTERICAL crosses YNE, or [Poison ivy, e.g.]. 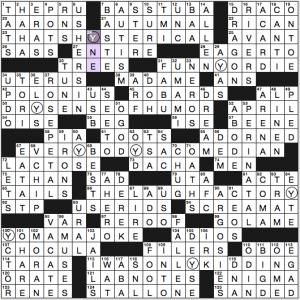 Now, I don’t know if the crossword’s editorial team has ever been in the woods, but most of the poison ivy I’ve seen does not take the form of a VINE (it can, I just typically see it more low to the ground—the plant is not an actual ivy). And each of the Across themers relates to comedy, another “cracking wise” angle. The other themers are FUNNY OR DIE crossing AYAS/Avias, DRY SENSE OF HUMOR crossing ELYS/Elvis, EVERYBODY’S A COMEDIAN crossing AYS/Avis and OYD/Ovid, THE LAUGH FACTORY crossing EYTE/Evite, YO MAMA JOKE crossing YCTOR/victor, and I WAS ONLY KIDDING crossing DEYSE/devise. Cute. I liked the fill overall but didn’t love it. 9d. [Suffix with speed], -STER. How many among you actually use the terms speedster or (from another recent -STER clue) jokester? Raise your hand. Anyone? Bueller? 31d. [“Terrif!”], FABU. I feel this is not commonly used but deserves to break out into the mainstream. 78d. [___ Walcott, Nobel Prize-winning poet], DEREK. I don’t know his work. Let’s have a look-see. Wow! Do you know “Love After Love”? Go read it. “Give back your heart to itself.” This is lovely. If you have a favorite Walcott poem, please share it in the comments. OISE, UTA, NERO’S, meh. I wasn’t feeling besieged by crusty old fill, though. 2d. [“Hilarious!”], HA HA. Not part of the theme! This week’s puzzle starts off with a note: “The Replacements” is a 2000 film with characters who serve as replacement football players. 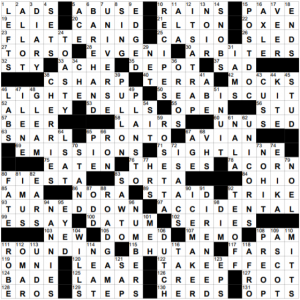 In this puzzle, I replaced 10 characters to spell out an apt phrase. The original characters spell out an event where that phrase might occur. The replacement characters spell a very fitting FALSE START, while the original letters spell COTTON BOWL. This is a nice timely tribute to Super Bowl LII. 129a. [Philadelphia Museum of Art architectural feature shown in a classic “Rocky” scene] STEPS. The steps were also shown in this video of a dune buggy riding up them after the NFC Championship Game. 115a. [Nation whose name means “Land of the Thunder Dragon” in its native language] BHUTAN. Their national flag features this Thunder Dragon, the Druk. 1d. [Foreman’s deliveries, at times] LEFTS. Boxer George Foreman, not jury foreman or construction foreman, which I got stuck on for a while. 16d [Mini bar?] AXLE. Mini as in the car make. 79d. [Seasonal strain?] NOEL. Thank you for not being FLU. 8d. [Emulate Mercury or Mars] SING. Freddie Mercury and Bruno Mars. Nice clue. Is this constructor’s name a pen name? It anagrams to “really … toe.” But he or she or they have had a CHE byline, so not a pseudonym! 27a. [Aptly named therapist? ], OPHELIA PAINE. I feel your pain. 39a. [Aptly named dietitian? ], EATON WRIGHT. Eatin’ right. 93a. [Aptly named easy chair salesman? ], RICK KLEINER. Recliner. 108a. [Aptly named gardener? ], ALONSO GREENE. A lawn so green. 13d. [Aptly named editor? ], ADELINE MOORE. Add a line more. 24d. [Aptly named sommelier? ], MERLO DALEY. Merlot daily. Wait. MERLO is not remotely a common first name. I call foul. 59d. [Aptly named barber? ], LES OFFENBACH. Less off in back. 62d. [Aptly named policewoman? ], LAURA BIDEN. Law-abiding. I appreciate a good pun, but this theme doesn’t work for me. There are real people out there with aptronyms (apt names), but I think this set of names are just made up to fit the theme. (And the spellings are a little arbitrary—PAINE could be Payne; GREENE, Green; DALEY, Daly; MOORE, Mohr.) My favorite aptronym is the late, great Claude Organ, renowned surgeon. If he’d gone into a non-surgical field, or if he’d been an orthopedic surgeon or a plastic surgeon, his name would not have been so perfect. Most of the aptronyms listed here hinge on the last name rather than the full name, which Dr. Organ nailed. 47a. [Pull a fast one on], HOODWINK. This word derives from hood + an obsolete sense of “wink” meaning to close the eyes, basically blindfolding. I never knew that till checking a dictionary for it. 3.5 stars from me. 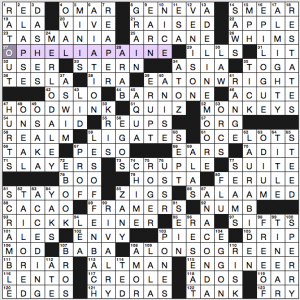 Did not care for the theme, but the rest of the puzzle wasn’t the typical slog through crusty Sunday fill. 23a. [Letters of CIVIL and MIMIC], ROMAN NUMERALS. C, I, V, L, and M are all Roman numerals. 34a. [Letters of DEAF and BADGE], MUSICAL NOTES. Anything with A B C D E F G.
52a. 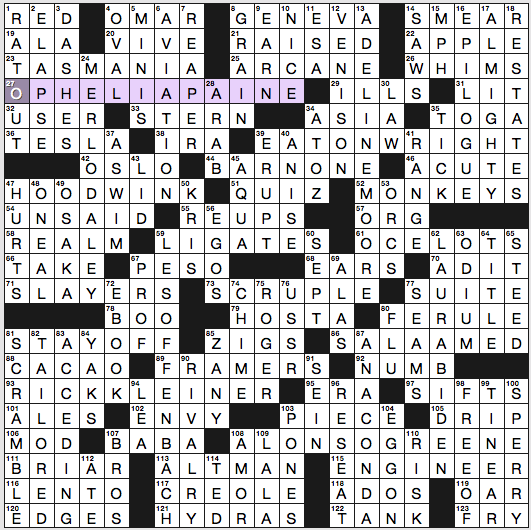 [Like letters in CHIMPS and BIJOUX], ALPHABETICAL. See also: Amy. 67a. [Like letters in MOM and RADAR], PALINDROMIC. I’d argue that those letters are not palindromic, the words are. 73a. [Like letters in SOS and COUSCOUS], CURVILINEAR. None of the straight lines of A, B, D, etc. 90a. [Like letters in LUMBERJACKING], NONREPEATING. 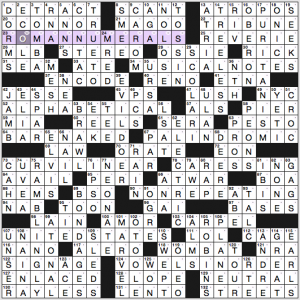 Isogram is the word for a word in which none of the letters appears more than once. See also: Reynaldo. 107a. [Letter pairs in ALPACA and MARINE], UNITED STATES. AL, PA, CA and MA, RI, NE are two-letter postal abbrevs for states. 124a. [Six letters in FACETIOUSLY], VOWELS IN ORDER. And each appearing just once—the word used for that is supervocalic. Kind of a fun set of obsessive-word-nerd observations. Didn’t solve the puzzle, just auto-completed the solution, so no notes on the non-theme fill and clues. This entry was posted in Daily Puzzles and tagged David Levinson Wilk, Emily Cox, Evan Birnholz, Henry Rathvon, Lee Taylor. Bookmark the permalink. 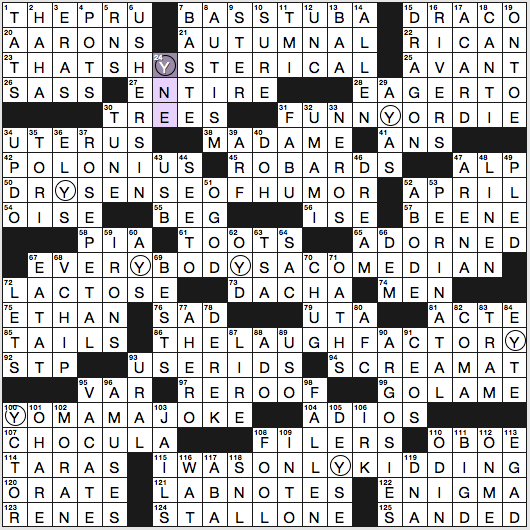 NYT: A lovely Sunday puzzle… easy and subtle- not strained or contorted… it felt like wearing a light sundress instead of a girdle and suit. Amy’s right that poison ivy has a very variable habit. It can grow as a shrub but the low-to-the-ground form is usually its trailing-vine version so maybe she sees vines after all. I live in the Santa Cruz Mountains and literally have acres of its Western relative, poison oak. It grows as a shrub in the open chaparral but as soon as it finds a tree it starts climbing and doesn’t stop until it reaches the top. I have a grove of beautiful wild madrones that are almost 100′ tall and some of them support poison oak vines clear to the top of the canopy. They don’t seem to harm the trees, which is good because I’m so sensitive to poison oak that significant contact will put me in the hospital. But the birds love the berries and the shrub form is home to lots of quail and rabbits so the poison oak and I pretty much go about our business tolerating each other. Poison ivy, oak and sumac are closely related to the tree that yields Japanese lacquer. The Japanese word for lacquer is “urushi,” and the chemical in poison ivy that causes the skin reaction is called urushiol. Urushiol is so potent that it’s believed a single molecule absorbed by the skin can cause an outbreak. The Japanese lacquer tree also produces urushiol. I once toured a lacquerware factory in Wajima, Japan. I asked how they avoided severe dermatitis. It turns out they can’t. The families that make lacquer can develop immunity (hyposensitization) after repeated contacts. If a child is born without this ability, and continues to have severe reactions over a period of months, he or she finds work elsewhere. This is just another reason that real laquerware is so expensive. It’s made by artisans who suffer for their art. Thanks, Martin. Very interesting! I imagine there is a genetic basis for the ability to desensitize (or even the magnitude of the initial response). That’s an impressive comment. I’m fine, though, with VINE simply because, for me without the experience of nature or the inclination to research, RHUD defines poison ivy as “a vine or shrub.” Can’t get better justification than that. MW11C has “a climbing plant,” which does the job, too. I liked the puzzle but not hugely. It went way, way quickly, but also led me into corners of, for me, crossing trivia, like DRACO, DRAGON, and FUNNY OR DIE (where the definition of CAN’T I maybe also felt a tad off). I’m guessing that they were very determined to create a puzzle for new, younger readers, so they figured the best way would be to have a ton of gimmes and trivia to which they could relate and might also find to be gimmes. It took me a while to read a Y as a V atop an I, and I liked that touch of confusion, even if it didn’t slow up my running with the rebus. So that explains the weird-looking word urushiol that never seemed to be constructed from Greek or Latin roots. Yep, urushi + ol (alcohol suffix). Amazingly, Japanese lacquer is polymerized urushiol. It’s not that the sap happens to contain this most potent irritant. It’s that the irritant becomes the lacquer. Totally mindboggling. One final lacquer factoid: you may know that Indians write large numbers in “crores” (ten millions) and “lakhs” (hundred thousands). “125,000,000” (one hundred twenty-five million) is written as “12,50,00,000” in India (12 crore, 50 lakh). This counting system is ancient. Lakh in Sanskrit is lakhsha, which derives from the insect (which we call “lac”) used to make another form of lacquer. It’s obviously where “lacquer” comes from. But the Sanskrit root for the insect, “one hundred thousand,” comes from magnitude of its (encouraged) infestations. Amy, not sure if you’ll see this, since I held Sunday’s puzzle until I had time for it on Friday, but the aptly named sommelier may have been a nod to ace constructor Merl Reagle. (Thus Merl O’Daley) I’m told the O’ prefix was a common variation of Daley or Daly or even Daileigh, though we don’t see it much these days. Love remembering Mr Reagle though. Feeling = into? I sort of get it but it seems to be a stretch. The cluing for the Times puzzle should have been funnier! 82D (“Bad state to be in” = COMA) did elicit a HAHA from me. Still, enjoyable puzzle overall. Derek Walcott was featured in the annual “The Lives They Lived” section of the NYT Magazine (12/31/17). My favorite special issue- I learn so much. In fact, Erin Moran was in the same issue: they both died in 2017. Best fact about Walcott (one of many): while he was in Boston he began a close friendship “triumvirate” with Irishman Seamus Heaney and Russian Joseph Brodsky; all three eventually went on to receive the Nobel Prize for Literature! Despite the ultra-corny,groan-worthy themers, I liked this puz more than any I’ve done in the past year, including WAPO & NYT. The fill was fresh and delicious, with minimal x-wordese, and some clever cluing (for SALAAMED, REAPER, SAWS and SEAMS). Only a few clunkers: MOD for “Hip”, ESA, O’NEAL, LENTO, RESTATES. New to me: LIGATES, FERULE, ODIUM, SEIN. So close to being a Perfect Puzzle. Keep it up, Lee Taylor, whoever you are! Where is “We Get Letters” by Cox and Rathvon which was published 2/1/18?